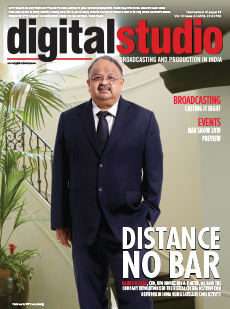 Digital Studio, India's leading technology magazine for media and entertainment industry. It is must-have trade publication with a focus on Broadcast & Film production technologies in India. Published by ITP Publishing India, the monthly magazine has been at the forefront of chronicling the digital revolution in Indian media & entertainment industry. The magazine focuses on present-day broadcast engineers, film technicians as well as channel partners involved in steering the industry from analogue to a digital era of media technologies, besides developing newer platforms of infotainment.